The Bank of Israel announced that beginning on Thursday, November 23, 2017 the new NIS 20 and NIS 100 banknotes will be distributed to the public via the commercial banks, automated banking machines and the Postal Bank. On Wednesday, November 22, 2017 the Governor of the Bank of Israel will present the new banknotes to Israel’s President, Mr. Reuven Rivlin at an event at the President’s Residence in Jerusalem. The new banknotes, like the others in the new series, include advanced standards of security, innovation and accessibility and include a variety of security features against counterfeiting. To assist the blind and visually impaired the denominations in the new series differ in length with a difference of 7 mm between each denomination and include special features, that make it easier to identify each denomination. The new NIS 20 banknote features the portrait of Rachel the Poetess (Rachel Bluwstein). It is red and it is 129 mm long. 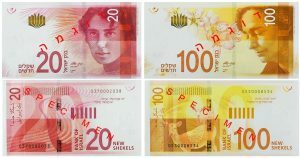 The new NIS 100 banknote features the portrait of the poet Leah Goldberg. It is orange and it is 143 mm long. 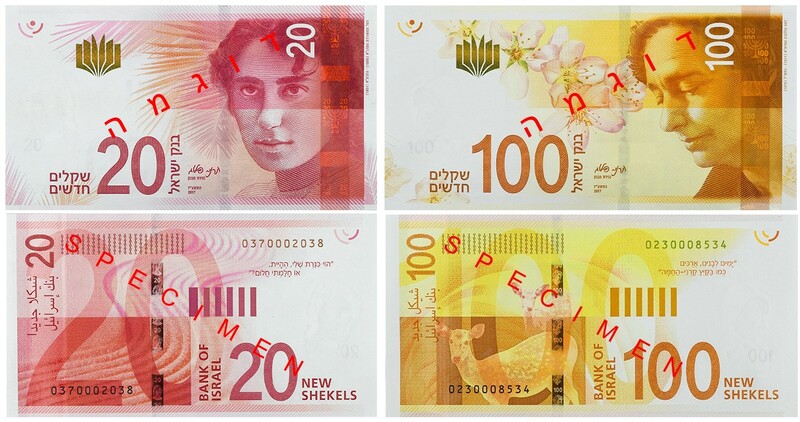 The Bank of Israel clarified that banknotes from Series B of the new shekel, which are still is use by the public, will remain legal tender for a number of years and will remain in circulation in parallel with the new banknotes.